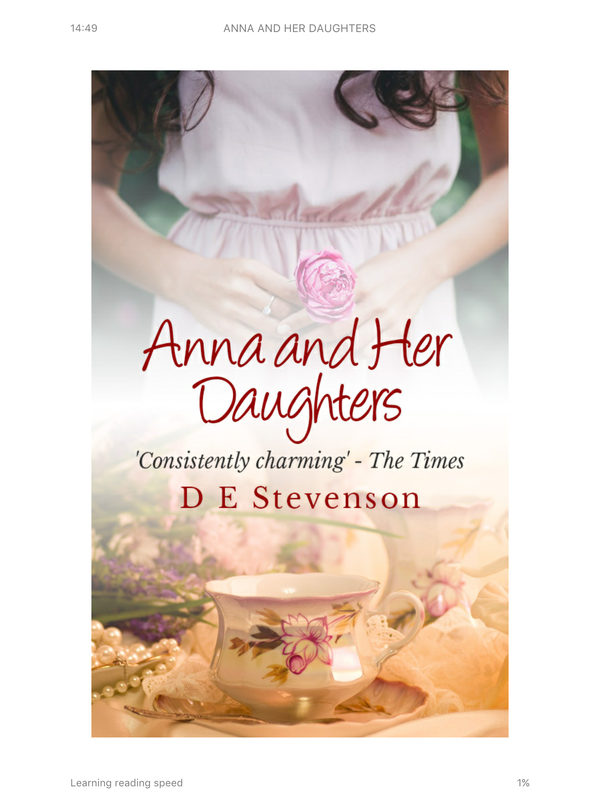 This week’s BotW is one I picked up as a Kindle Daily Deal a couple of weeks back: Anna and her Daughters by DE Stevenson. You may remember me waxing lyrical about my love for Miss Buncle and her book back in a #Recommendsday about Comfort reads a while back and this was the first non-Buncle book I’ve read by DE Stevenson. I’m not sure about the cover on this, but hey, when the book is good it doesn’t matter! The Plot: Anna’s husband has died and the family’s finances are in a mess. They’re going to have to sell the London house and move to somewhere smaller. Anna decides that she wants to go back to the area of Scotland that she grew up in and starts making plans. None of her three nearly grown up daughters are precisely keen on the idea, but only one, Jane, is prepared to make the best of it. Anna and the girls move – Helen and Rosalie are practically kicking and screaming – and start their new lives. The story is told through Jane’s eyes – she’s the plain but clever sister, who would have gone to Oxford if it hadn’t been for the money problems. Helen is pretty, but selfish and used to getting her own way. Rosalie isn’t as pretty as Helen, but isn’t clever like Jane either and tends to drift along in Helen’s shadow. The combination of the three sisters makes for fascinating reading. Anna is remarkably clear sighted about her daughters in some ways – she sees their faults in a way that many parents do not. She tries to explain her attitude to Jane, who (justifiably) gets angry about the way that Helen treats people and the fact that she gets away with it. As the book goes on we see the girls grow and change. Jane discovers a gift for writing, Rosalie chooses security and Helen continues to be Helen, regardless of the consequences. This book is very melodramatic in some ways but also feels like nothing much happens. I loved it. Especially when Miss Buncle gets a quick mention. Anna and her Daughters is available in Kindle or you’ll have to go and find a secondhand paperback copy, which by the look of Amazon maybe expensive. I had such a tough job picking a book for BotW this week, because I really didn’t read anything that I whole-heartedly loved. I started reading a lot of books and then gave up on them, and I finished a few – including a real stinker. 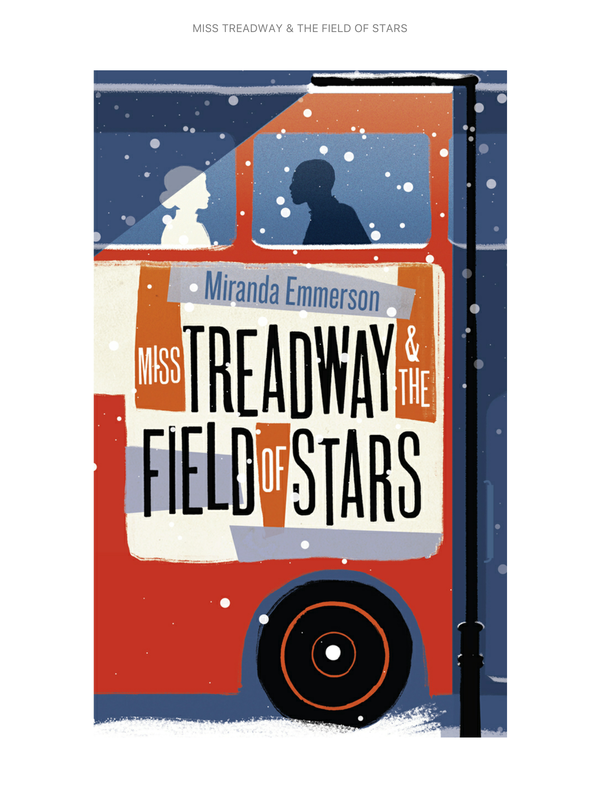 But in the end I plumped for Miss Treadway & the Field of Stars by Miranda Emmerson. As I mention below, Im not quite sure the cover for this is quite right. Anna Treadway is a dresser, working in a London theatre and living above a Turkish cafe in Soho in 1965. When the actress who she works with disappears, she sets out to try and find her as the trail grows cold and the newspapers lose interest. As she hunts for the mysterious Iolanthe Green she finds herself in new world of jazz clubs, police cells and backstreet doctors. Whilst this wasn’t perfect, it was an interesting idea and a great cast of diverse characters. It’s got an interesting mystery that’s well thought through and several different plot strands which tie together quite nicely. Underneath the mystery of where Iolanthe has gone there are issues of prejudice and race and people struggling to be heard and believed. From the look of the (UK) cover and some of the write ups I was expecting it to be ultimately more uplifting, but perhaps given the issues that it’s dealing with, I was being unrealistic. This is Miranda Emmerson’s first novel and it does a great job of creating the atmosphere of 1960s London and the grimier side of life. In fact that was what I liked best about it – the mix of people thrown together, some times living side by side without ever intersecting. I think I would have liked more of Anna’s backstory and I wanted a bit more of what happened next at the end, but I pretty much always want more of what happened next at the end! My copy came via NetGalley, but you can get Miss Treadway & the Field of Stars from Amazon, Foyles and Waterstones or on Kindle and Kobo. It only came out a couple of weeks back so it’s hardcover and the ebooks are priced accordingly too I’m afraid. The paperback is out in July, so it may drop a little then, if you want to add it to your wishlist and wait it out. Quite a tough decision on what to pick for BotW this week – there were several contenders. 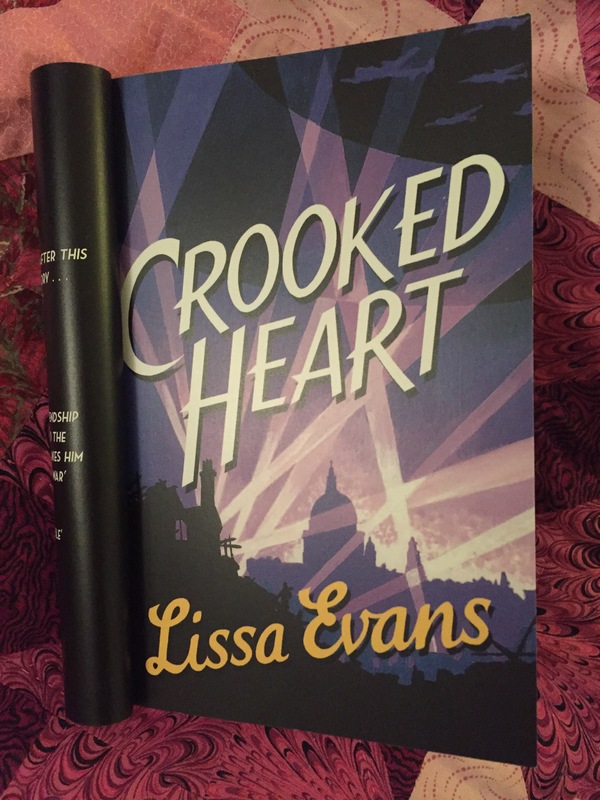 But in the end I’ve plumped for Lissa Evans’ Crooked Heart, which I devoured over the weekend while we were away for an extended jolly for my birthday. This was another book which had ended up at the bottom of my to-read pile and resurfaced because of the Big Box Up and I’m so glad that it did. Mine had an extra cover on it – the actual cover is prettier. Crooked Heart tells the story of Noel, who is evacuated to Hertfordshire in 1940. Noel is an unusual 10 year old. He’s been brought up by an old lady and is precocious and smart beyond his years. He ends up with Vera – a 36 year old single mum struggling with debt, a recalcitrant and secretive son and her demanding mother. Vera is sure there is some money to be made out of the war, but the trouble is that she’s not very good at making a plan and sticking to it. But Noel is a different proposition. He’s smart, he’s calm and he might be the answer to Vera’s problems. But of course they’re not the only people making money from the war, and there are dangers other than air-raids in Noel’s new life. I really enjoyed this. Noel and Vera are engaging characters who make a good team. Vera is almost a proto-Del Boy – but with Noel to help she has the chance of her deals actually going right. In some ways Noel reminded me of William in Goodnight Mr Tom (that’s a good thing) – Noel has had more advantages in his education and home life that William did, but he’s still a little boy who has had to grow up too fast and deal with things that children aren’t meant to deal with. And one of the themes of Goodnight Mr Tom is finding your own family and your own place in life and there’s a lot of that here although Vee is very different to Tom. It’s a heartwarming romp through the grey, greyer and uglier areas of life on the home front. I could easily have read another 100 pages of Vee and Noel, but actually the ending is a brilliant touch. I haven’t read any of Lissa Evans’ books before, but my little sister still has a copy Evans’ first novel, Spencer’s List, on her shelf which I bought for her back in the day 15 years ago, so I’m going to have to borrow that off her and read it. Coincidentally someone posted a trailer on Facebook for the upcoming film Their Finest on the same day as I read this – and that’s based on Evans’ previous book Their Finest Hour and a Half, which I totally need to read now as well. You can get a copy of Crooked Heart from Amazon, Waterstones and Foyles or on Kindle or Kobo. And it looks like there might be a (slightly retitled) tie-in edition of Their Finest Hour and Half coming out too.